Description Creativity in Conversation A music and arts podcast focused on getting to know artists of different styles and backgrounds through a laid back and casual discussion. This is just a brief audio file containing me telling you, rather sadly, that we wont be releasing episodes for awhile, at least in the near future. As heard in the audio, I (Jason) want to focus on another podcast idea and also the new adventure of learning to record music. Thank you so much anyone who has been a guest on the show and to those who have been listening, it means so much! I hope you'll keep us in your podcatcher and I will release any info on the new pod when it happens! This week we get to hear from Tulsa's The Daddyo's! Kylie and Kylie, the two creators of The Daddyo's, visited the studio and brought their guitars and voices to play us some of their beautiful music! On this episode you'll hear about their journey from being friends as early as 6th grade to now playing and writing music together. You can find their music and more information at their Bandcamp page! On this episode we get the chance to hear from Tulsa's own Art Rock band, Oceanaut. On this episode you'll hear some of their story from forming in 2011 to their recently released debut album called Evidence. You can find them on Facebook or Twitter and pick up the record on their Bandcamp page. After a brief several year hiatus, Wither is back to making music together and came to tell us about it! On this episode you'll hear about their writing process, a little about the music they are making in the studio right now, and a few acoustic songs played right here in the basement! This week we get the chance to welcome John Calvin Abney and his friend Eli! He's returned with brand new music from his record Far Cries And Close Calls that releases Sept. 23 everywhere music is sold! On this episode you'll hear 3 songs from the record and one recorded acoustic live in our studio. You'll also hear about the recording process and why he chose to record this album with a live band and in a very short time. Dad. The band joined us to play some acoustic versions of their songs and to let us into the world of Dad! On this episode you'll hear about their writing process, how the band was formed and hopefully a few accidental Dad jokes! You can find them on Bandcamp, Soundcloud, Facebook, and featured on this video by 1882 media. Sterling Matthews is a spoken word poetry artist, a teacher, and now an author! He visited with me in the studio to catch up and have a conversation about his new book Metaphorically Speaking and the processes he goes through for writing, teaching, and performing poetry. He even performed three of the pieces of poetry you'll find in the book in studio! 8. Ep 125 - DocFell & Co.
DocFell & Co. Spent an entire morning and afternoon with us in the studio recording some songs and having an all-around great time! The gave me the opportunity to record a multi-track song for the first time and to break in some new studio gear! You'll also hear a fun conversation about the recording of their second album and and update from when they visited us before. Be sure to visit http://www.docfellmusic.com/ for all of your DocFell needs! Cole Porter Band Joined us for another super fun episode! If you haven't heard they were in the basement for episode 81 about a year ago! In this episode you'll hear a mostly off the rails conversation about what they have been up to with their writing and touring. we spoke a little about slinging pokeballs and Cracker Barrel visits. Cole and Kendra even played us an acoustic song in studio! Facebook/Twitter/Band Instagram/Kendra's Instagram/Track them on Bandsintown/ Visit the www.coleporterband.com website! Hello and welcome to the first episode on our new Friday release schedule! On this episode you'll hear music from and a conversation with Konkoba Percussion, a drum ensemble from Tulsa, OK, who focuses on traditional rhythms from West Africa. The brought some beautiful hand made instruments and performed for us in studio! That was an absolute blast to record. You can find more information about where you can find their performances or workshops on their Facebook page. This week we got to spend some time with Blake Jarman and Ryan Wallace who make up the Tulsa two-piece band Maria Fantasma Duo! On this episode you'll hear a fun, interesting, and sometimes a little weird conversation on art and creativity and a little about the writing and production that went into the making of the band's most recent EP "Poor Man's Graceland," which is now available on Bandcamp! On August 3rd, Maria Fantasma Duo will be playing live at the Soundpony here in Tulsa and will be joined by Something and the Whatevers who will be visiting all the way from Lawrence, KS! They gave us permission to share a song with you and you'll hear "It's Never Fair" to close out the episode. Fiawna Forté and her husband Phillip Hanewinkel Visited the studio for a great discussion on music and art and where you might find creativity! On this episode you will hear two songs off of their newest release Deciduous and a brand new song called "You Don't Live Here" recorded right here in the basement just for us! Find them on Facebook and Twitter or their Youtube channel! This week we get to feature the incredible talent from KALO, a three piece band from Oklahoma City! We spent some time recording two songs in the new studio and having a conversation ranging from where each member thinks creativity might come from to how beating a musician who is playing hard to get may be the way to get them in your band! Follow them on Spotify, Facebook, Twitter, or Instagram! Here is where you can purchase "Dear John" on iTunes. This week we get to feature a conversation with Tulsa's own Johnny Badseed and the Rotten Apples! They visited with brand new music to share along with some homemade mead and a fun conversation. This episode was recorded before their self-titled album's release date but, lucky for you, it"s now available on their Bandcamp and iTunes! here is where you can find them on Facebook. Cindy Hulsey, Executive Director of Tulsa Literary Coalition and soon to be General Manager of Magic City Books, stopped in to the brand new studio to have a conversation about some of the cool things that will be happening soon in Tulsa's Brady Arts District! We talked about some of the goals of the Literary Coalition in the community and spent some time learning about Cindy and how she became involved. You'll hear about some of the times that reading changed lives, how reading can be a personal creative endeavor, and the types of things reading can teach you. If you'd like to learn more you can visit http://www.tulsalitco.org/ or http://magiccitybooks.com/ and be sure to find Book Smart Tulsa on Facebook! This week we get to release our talk with Levi Parham! Levi Parham, from McCalister, OK, stopped by the studio perform two acoustic songs and to let all of us hear some of his brand new record, These American Blues, which is available everywhere music is sold this Friday June 24th! You can also get two songs now if you pre-order on iTunes! Evan Hughes, a Tulsa comedian, visited to have a conversation about his entrance into comedy and tell us about what has changed since then. We heard some stories from his experiences as a comedian and learned how it has affected his life and confidence since he began. You can find and friend him on his personal Facebook page! This episode features the return of Brandon Clark except this time he brought with him his entire band BC & The Big Rig! BC & The Big Rig describe themselves as "Shred Dirt" and taught me the term Guitarmonies on this episode. We spent some time discussing the history of the band, some curious side projects they're involved in, and the dynamics involved in a band that has 3 guitarists. Bud Bronson & The Good Timers, from Denver CO, visited the basement for a fun conversation and to let us hear some of their wonderful music! We were nominated for a Podcast Award! If you'd like to vote for us you can do so on their website at http://podcastawards.com/ We'd very music appreciate it! This episode features Darkbird, an incredibly talented band who visited our studio all the way from Austin Texas. This week you will hear a hilarious conversation ranging from where you would find creativity to what band life is like when you are independently wealthy! I really enjoyed this conversation and the music we get to play, I think you will too! This week we get the great opportunity to feature our friends in the Austin based band Migrant Kids. They were on tour supporting their brand new EP Primordial Soup and made a stop in Tulsa to spend a day with us! In this episode you'll learn the history of their band forming, where creativity might come from, and a little about how they prepare their live show! You can purchase their new songs by visiting their Website, Bandcamp, iTunes or wherever you find your music! This episode features the man behind the scenes over at City of Tulsa Parking Enforcement. Austin Bryant, a Tulsa Comic and the winner of The Tulsa Voice's Best of award for "best Tulsan to follow on social media" with his hard work on @Tulsa_Parking. Joining us in this conversation was Austin's "body guard" and comic Evan Hughes, and LaRoY Parks, a City Of Tulsa Parking Enforcer. Visit the Tulsa-Parking.com website to find ads to click to support the merch endeavors! Be sure to subscribe to our show to be notified about future episodes! And visit www.fromabasementintulsa.com for more. Welcome to another Featured Artist episode! This time we got to chat on the phone with John Wittlinger of the band City Under Siege! They were in town a few weeks ago but unfortunately we weren't able to catch up with them. But, John was gracious enough to call in and tell us about the band and their music! This episode features the song "Shake" which you can find on their self-titled EP here on iTunes and their lyric video! In this episode, we are very excited to share our conversation with Jon and Dmitry from the New York band, Lion in The Mane! We spent some time discussing their newly released EP, ECHOES IN ABSENCE, the entire history of the band, and their takes on creativity and success! Here is where to find their new songs on iTunes! On this weeks episode we get to hear from our long time friends, the staff at The Hunt Club! Mary Ellen, the owner, brought along Billy, JP, and Mike, all bartenders and great dudes you can catch having fun and making drinks at one of my favorite places. I credit THC with a lot of my growth as a singer and a musician as it was where I spent the most time playing songs. I even had regular Jason Ferguson nights! So, I hope you enjoy hearing some fun bar stories from some of my favorite people! For more information you can visit http://www.thehuntclubtulsa.com/ or find them on Facebook or Twitter. 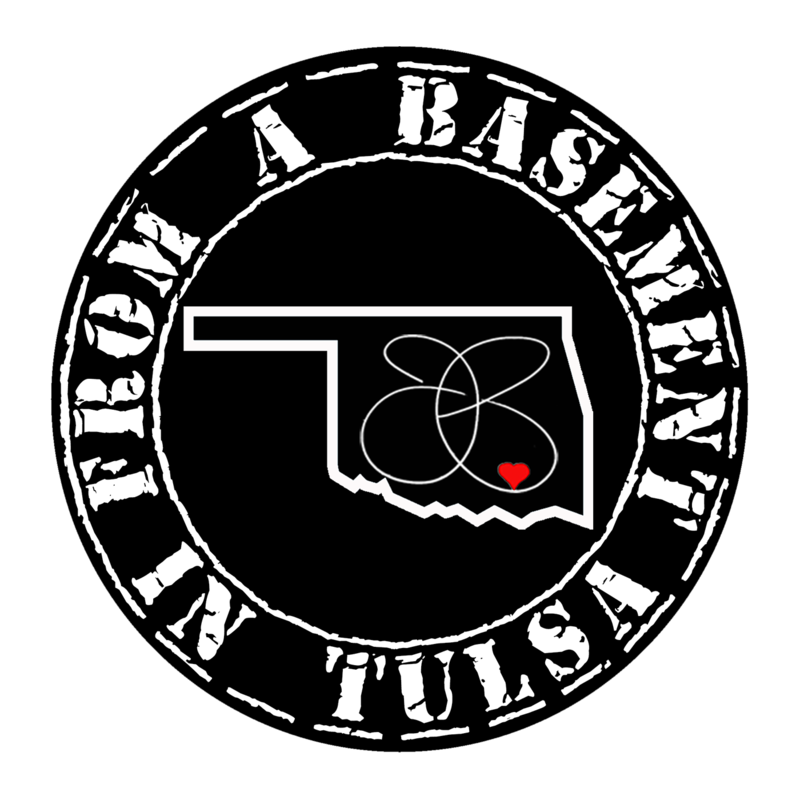 To find where to follow us or links to subscribe to the show you can visit us at http://www.fromabasementintulsa.com/! This week we had the pleasure of getting to know the Tulsa trio, The Whiskey Misters! They brought along their second album,Two, which releases later this week. We talked about the band forming, the times we've ran into each other in the past and their character names. For more info about the band visit their website and find them on Facebook and Instagram. If you're in Tulsa, don't miss their release show this Saturday, April 23rd at the Mercury Lounge with special guest Cody Brewer as the fourth mister and Chloe Johns and Justin Cooper kicking things off. Welcome to episode 106! This is the third and last episode of our Easter Island Festival Preview series and it features one of the few musicians that have been part of the festival every year, Paul Benjaman. We discussed his music career and his latest album, Sneaker. For more info about Paul and his music visit: http://www.paulbenjamanband.com and find him on Facebook, Twitter, and Instagram. Our good friends from the Oklahoma City based band, Nicnos, made the trip to Tulsa so we could hang out, catch up, and hear about their new album Nicnos II. We spent some time talking about their recording process, what they love about their own music, and about their Non-Profit project Music To Your Peers. Here is where to find the us! Ep. 104 is the second episode of the Easter Island Preview Series where we partnered up with the organizers to feature artists playings the upcoming festival. On this episode, we got to talk with Tony Gray, a multi-talented musician who is debuting his latest project, The Tony Gray Band, at the festival. Tony played some of his new songs and also shared a few from his album. The Tony Gray Band plays at Easter Island on Friday, April 15th at 5:00PM, make sure to catch their set! Dan Martin, a singer-songwriter from Tulsa, OK, visited the studio, played some beautiful music for us live and a couple songs from his debut album Hoka Hey. We fell in love with Dan's music seeing him play acoustic and we're so glad we get to share some of his music with you! The Tulsa Office of Film, Music, Arts & Culture and Circle Cinema present the First COMBINED Film/Music Mixer & Panel Series: “The Making of Music Videos"
The Tulsa Film/Music Mixer & Panel Series is for those working in or interested in the film and music industry. In this panel we discuss how a song inspires the video, why the artists want a video, the director's vision of the project, and more! "Everyone is On Our Side"
For more info about TulsaFMAC and future panels, give them a like on Facebook or follow them on Twitter and Instagram! Taylor Graham & Cody Brewer visited the studio in the first of a series of previews to the Easter Island Music Festival! Taylor, currently playing with Branjae & the Filthy Animals, let us hear a song from his newest musical and non-profit project Henna Roso. Henna Roso will play their first preview set at this years Easter Island. Cody, from the band Grazzhopper, is one of the organizers for the festival and joined to answer some questions I had and to tell us some of what goes on behind the scenes and share some more about his musical background. Here are lots of links! On this episode we got the great opportunity to hear from The Tulsa Voice! Joshua Kline, Managing Editor, Liz Blood, Assistant Editor, and Madeline Crawford, Creative Director for the bi-weekly newspaper, stopped in to tell us about their creative process and how they got their start in their crafts. The voting just ended for the Best Of Tulsa Readers Choice Awards and we spent some time talking about some of the categories and even a few choices that didn't make the cut! Welcome to episode 100! This episode marks a huge milestone for us and to celebrate we decided to do something special. We partnered up with our good friends, Jerry Wofford of Tulsa world and Larry White, to record our first episode with an audience at the Woody Guthrie Center's theater. The episode features Jerry as our co-host, a beer review by our friends over at Pubtalk Podcast, Producer, Drummer and Author Martin Atkins, Photographer Jeremy Charles and the folk duo, Desi and Cody. We are incredibly humbled by all the love and support we have received and would like to thank our partners, Jerry Wofford and Larry White for helping us plan the event and book amazing guests, our incredible guests for taking the time to be a part of the show, our friends and family who attended and the 99 guests of the podcast that have played a huge part in getting us to Ep. 100! Special thanks to the Woody Guthrie Center and The Hunt Club for making the event and the after party possible. We could not have done this without you! If you happen to be at SXSW this week, make sure you catch Martin's Band:Smart: 50 Ideas to Make $100K More This Year presentation on Wednesday and Desi and Cody's set at the Tulsa Boom Factory Music Day Party! Seth Park from the band BRINGER stopped back by the studio to continue our conversation and pick up on the things we missed when he was here on episode 98. We spoke quite a bit about how he built his own amp and his own reverb tank. He shared some brief information about how an amp works and whats happening in analog reverb and tape delay. He even brought his reverb tank so we could hear an example! Be sure to check out episode 98 to hear some brand new songs from his band's Black & Gold EP! This week's episode features a conversation with Rod & Denise from The Listening Party Podcast! We spent some time speaking about revealing your personality through podcasting, starting a podcast to get revenge, and finding rouge nail clippings. If you enjoyed hearing about their show, be sure to find it in your favorite podcast player! 39. Ep. 96 - DocFell & Co.
DocFell & Co., from Tahlequah, OK visited the studio to play us some music and let us have the chance to get to know a bit about them! We discussed many things including professional day jobs, accidentally using body wash instead of shampoo, and the importance of knowing how to back up a trailer. Musician and Songwriter, John Calvin Abney, visited the studio for episode 95! We spent some time getting to know each other, discussing his influences, and mostly talked about how excited Jason was to have him here playing music and to receive a copy of Better Luck on vinyl! Please be sure purchase some of his music! Tony Romanello and The Black Jackets stopped in to share some brand new songs with us! In this episode you'll get to know the band, their history, and a bit about their creative process. They let us play three songs off of their upcoming album Chasing Airwaves available online February 16th. They'll be celebrating it's release Saturday, February 20th at The Shrine! Presented by Tulsa Office of Film, Music, Arts & Culture and Cain's Ballroom- The Tulsa Music Mixer & Panel Series is a bi-monthly event for those working in or interested in the music industry. Hear from leaders in the music scene involved in a wide variety of music focused initiatives. From venues to festivals, recording to touring, and media- how they started and where they are going. This episode features Blake Jarman! Blake is a long time friend and an incredibly talented musician who has played around Tulsa with many projects, Including playing music with Jason's band. He brought with him, "That Swing", the only released song from his newest project That Candor. You can find the band on Facebook, Twitter and on their Bandcamp. Find Jason on the Our Liner Notes Podcast! Hello! This is another Featured Artist Bonus Episode where we speak on the phone to someone we are interested in that happens to not be in Tulsa. In this episode we'll be hearing from Chris Young, the drummer of Darkbird, who is based in Austin, Texas. We spoke about a few moments of creativity and he even mentioned the exciting moment when a song is played all the way through for the first time. While you are listening to podcasts, be sure to check out Jason's two visits to The Listening Party Podcast! This episode features the incredibly fun Rock band, The Fabulous Minx. We spent some time discussing their origins, how easily they are distracted, and listened to their anthems including "Knife Fight" with the thought provoking lyrics "Knife Fight, Knife Fight." I hope you enjoyed getting to know this band as much as I did! All of their music can be found for free on Soundcloud and for purchase on Bandcamp. CORRECTION: We previously stated that all music featured in this episode was composed by Walter Bricht. However, Schubert's Trout Quintet was not. The recording does feature Mr. Bricht at the piano playing the whole number by memory. On this week's episode, Dana Higbee and Delia Pierson from the Signature Symphony, stopped by to share stories about Ellis Island to promote the upcoming symphony performance featuring a collaboration weaving West Side Story, On The Town, and Adagio for Strings with stories from Ellis Island's Immigrants in a multimedia performance. If you're not familiar with the history, Ellis Island was the gateway for millions of immigrants to the United States as the nations busiest immigrant inspection station from 1892 until 1954. Dana's Father was Walter Bricht, a noted Austrian-American pianist, composer, and teacher who came to America through Ellis Island. Delia's Father, Jimmie Saied, a son of immigrants through Ellis Island, founded Saied Music store in Tulsa, OK which is celebrating its 70th year in business. Jimmie also testified before a Congressional committee to have John Phillip Sousa's "Stars and Stripes Forever" become our national march. Visit http://www.fromabasementintulsa.com/ for some of the pictures mentioned in the podcast! James and Rumian from Passive Recordings, a record label based out of Broken Arrow, OK, visited to tell us a little about the behind the scenes of a label like theirs! It was absolutely incredible hearing stories about their beginnings and to hear their perspective and all about their passion for this project. This episode features music by Nuns, Native Lights, and Junfalls, all featured on the Passive Recordings Label. 48. Ep. 89 - Cain's Ballroom - The Cain's Fam! For the first episode of the year we invited back our first guests in the new studio! Hunter, Brad, and Chad, The Cain's Fam, stopped in to talk with us about the incredible year Cain's had, what to look forward to in the new year, and to tell some fun stories! This week we are releasing a clip episode reviewing our year as we are taking the last two weeks of the year off! Ep. 40 - Steve Gerkin, Author of "Hidden History of Tulsa"
The Plums, a two-piece Rock band from Tulsa, Oklahoma, visited the studio to have a laid back and incredibly fun conversation about their new EP Snub-Nose, their musical history, their recording process, and plenty of other topics. This week we got to hear live performances from the Salsa collaborations of Mezclave and Orquesta D'Calle. We also had a wonderful conversation about the roots of Salsa music, the writing and performing of different styles of Salsa, and a little background of some of the most incredible musicians I've met! Cody Brewer, co-creator of the Bluegrass/Folk band Grazzhopper, visited the basement and brought along with him their debut self titled EP! We got to hear 3 brand new songs before the release date of this Friday, Nov 27, 2015. Visit http://www.grazzhopper.net/ to find out more information and we will edit this description as soon as links become available. Like Grazzhopper on Facebook! Ian Moore, From Austin, Texas, returned to the basement and this time he brought with him exclusive songs and his band, The Lossy Coils! We discussed where creativity comes from, interesting rhyming styles, and how confidence is affected when you're sensitive to your art. At the beginning of the episode, after an awkward intro, you'll hear a recording from Ian's first visit explaining and playing his song "Battlelines" which was the first song played live for the show! Jason Heath & The Greedy Souls, an Americana band From Los Angeles, California, stopped in to play us some beautiful music and answer some weird questions about creativity, artistry, and toe tambourines! If you enjoy their music and their genuine personalities as much as I do, please help spread the word and share this episode with a friend! Eli, Cody, and Tim from the Norman, OK band, Helen Kelter Skelter, visited on Halloween night to tell us about their band and let us hear some of their music. It was their first time on a podcast and I think it was a fun one! They even brought us "Fun Time at the Mansion" a song that was played here first! Find all of your HKS info on their website and find them on Facebook here. John Van Risseghem (VanRiss) visited the studio to let us hear a few of the songs on his newly released album Every Streetlight & Every Turn. We discussed the writing and recording styles that John has developed over the years of going out of his way to not only be unique, but to also stay true to his artistry. You can find Every Streetlight & Every Turn on vanriss.com or on here. This week we got to meet and become friends with The Cole Porter Band! We spent some time discussing and playing some of the songs from their debut album Devil By The Tail. Find the band all over the internets! Here's where to find Devil By The Tail on iTunes! This week the Pub Talk Podcast dudes revisited! We recorded an emergency episode to figure out some new gear and it was some of the most fun. For sure wear headphones.. Maybe two pair. You can find them at http://www.pubtalkpodcast.com or search for them on iTunes and Stitcher! This episode features Jesse Joice! We caught up and discussed his recently released EP, Oklahoma Weather. You can find Jesse on Facebook/Twitter/Instagram or find Oklahoma Weather on iTunes! This week the Tulsa based band Skytown revisited to catch up and to tell us about their freshly released album, Outshine The Sun! You can find more information about the band on their Website, Twitter, and Facebook or find their album on iTunes here. This week's episode features the Lawrence, KS band, Cowgirl's Train Set, who were in town playing music for anyone who would hear it! It was a beautiful time having them over and getting the chance to become friends and hear them play some of their music. you can find the video of them playing on Good Day Tulsa here! Find them on their Website, Facebook, or Bandcamp. This episode features Billy Bazar, Ryan Green, and C.R. Parsons, three Tulsa based comedians who are hitting the road on The Distinguished Gentlemen Tour! We discussed what made them decide to be comics, where their confidence for stepping on the stage comes from and some of the inspiration that goes into their act. Grass Crack joined us in the studio this week to play some beautiful Oklahoma Bluegrass Gangsterbilly music. We discussed many things ranging from the dynamics involved in street performances to a few things even antibiotics can't cure. For this month's Featured Artist segment, we would like to introduce you to one of our new favorite bands, the Austin trio Migrant Kids. The band took a break from their busy schedule to call in and talk to us about their story, what it means to be a "jungle" rock band and the recording process of their up and coming album. We also got to hear about their new single, "Thread", which was produced by the band's long time friends The Bright Light Social Hour. For more info about Migrant Kids, visit their website here. Find them on Soundcloud, Youtube, iTunes, Instagram and Facebook! This episode features the return of the Oklahoma City band The Nicnõs! After a busy year of touring and playing some of the craziest festivals, they stopped in to play us some beautiful music in studio and tell us about their plans for the next album! Watch them perform on Oklahoma Music Shop! This episode features Ben from COTU and his wife Vanessa. Ben gave us an inside look at the producing of EDM music and we discussed the artistry that went into creating his newest album Release The Hounds. While we were recording Vanessa took some beautiful photos of the studio and of the recording process which can be found here! Find the music you've heard here and more on COTU's new SoundCloud. In this episode you'll hear from Liz, Alicia Astaire, Jenni Foxx, and Hexi Lee Voodoo who make up, at least some of, The Tulsa Pin Up Mafia, an unofficial name for a fun group of ladies who are involved in the art of Pin Up here in Tulsa! We discussed how they got into Pin Up, what to expect if you attend a Pin Up competition, and even how to become involved if you're interested! and follow upcoming events here at Pink Peacock Pinup. This week, we had the pleasure of sitting down with the Music Director of Tulsa's Signature Symphony, Andres Franco. Andres holds a bachelors degree in Piano Performance from the Pontificia Universidad Javeriana in Bogota, Colombia, as well as master of music degrees in Piano Performance and Conducting from Texas Christian University. Jamiee Paul - Bonded in iTunes! Melissa Cameron Rhoades, host of I AM Yoga Festival, stopped by the basement to share with us some of the knowledge she's gained in her 15 years of practicing and teaching yoga and to let those of us living near Tulsa know about the art, music, and speakers we will see a the IamYoga Festival on August 15th and 16th! Here's where she teaches online! Music in this episode provided by BrujoRoots! Find them on Facebook here! Welcome to another Featured Artist Episode where we have an artist who doesnt happen to be in Tulsa call in to tell us about the col things they're up to! This episode features Tulsa native, Rob Ingraham, who plays Saxophone for a band based out of New Orleans, Louisana called "The Revivalists" who just released a new full length album Men Amongst Mountains. Here's a bunch of links I promised in the episode! Our 69th episode features The Dirty Mugs, a decade old band living right here in Tulsa, OK. They stopped by the studio to share with us some of their music from their most recent releaseWildfire and to let us get to know one of the most fun groups around! This is also the first time a guest has removed their pants. Find them on Facebook,iTunes, or evenBandcamp. here is the google search they reccomended! Steve Cluck is the Tulsa Pop artist that created the Don't Hate the 918 and I Heart Tulsa merchandise lines and a lover of everything Tulsa! You can find him and his projects at http://donthatethe918.com/, Etsy, Facebook, and his Instagram. The multi-talented Rebecca Ungerman stopped by the basement to share stories about her impressive career in the entertainment industry. It was an honor getting to know Rebecca! Keep up with Rebecca and her latest projects by visiting her website! Also find her on iTunes, CdBaby, Youtube, Facebook, and OySongs. Thanks for listening! Make sure to listen to our previous episodes with Hey Judy and Jerry Wofford and rate us on iTunes! Hey Judy is a 3 piece band based here in Tulsa, OK who came over on a Sunday afternoon to play us some songs and tell some of their stories! Heres where you can find them and their songs! Jerry Wofford, music and feature writer for The Scene over at Tulsa World, visited the basement to discuss his background and tell us stories from his work in the Tulsa scene! I had the most fun hanging out and getting to know Jerry! find him on twitter at https://twitter.com/jerrywofford and find some of his work at the links below. On this episode, I got the opportunity to get to know Tulsa's infamous BOXMAN thanks to our mutual friend John from VanRiss and The Threaded Fox! Cat Dead, Details Later is a three piece band based here in Tulsa, Oklahoma that visited our studio and played us some songs! It was really great catching up with long-time friend Wayne Mack and meeting his new band! Hello and thank you for listening! This week we have our friends and fellow podcasters John, Jeremy, and Micheal, the hosts of The Pub Talk Podcast! It was very fun getting to know the guys and learning about the artistry that goes into planning and creating their hilarious show! Joe Myside, a talented musician in several styles, stopped by to discuss his newest project and his solo albumOff course. Of course. I really had a blast getting to speak with Joe and learn a little about his life and the inspiration he puts into his music. We discussed many things including releasing his music on a cassette tape, playing shows on the road, and overusing the word man. Find Joe Myside and his many projects on social media! The guys in Autumn On Javine visited our studio to play some songs and discuss the beginnings of their band, where the band got their name, and where you can catch them playing live. I had a blast getting to know them and learning about their creative inspirations! Well Hung Heart joined us for another episode and brought some new songs! They drove to Tulsa all the way from Orange, CA to see the new studio and hand deliver their new Self-Titled EP! Find Well Hung Heart on the webz! Deacon, a Tulsa based comedian, and Meg who works with Tulsa's Guthrie Green, are both on the team who is bringing us the Blue Whale Comedy Festival in Tulsa on June 18th through the 21st! They stopped by the Basement to tell us all about the festival and give some insight into what its like to be a comedian and a festival organizer. This month's Featured Artist is Oklahoma based singer-songwriter Samantha Crain. and discussed the artistry that went into the song-writing and even got to hear "Outside the pale." Her album releases on July 17th and you can find it online and in your local record stores around the world. Find Samantha on social media! Abby Kurin, Director of Film, Music, Arts & Culture at VisitTulsa and Chris Kucharski, City of Tulsa's Film and Music Liaison, visited the basement to discuss what goes on at the Tulsa Film, Music, Arts & Culture Office and to let us know what to be excited about in the future while they work to continue Tulsa's growth as a "Creative Hub." The Kayfabe joined us in the new studio along with the hosts of THE RAW DOG PODCAST! Brandon Clark is an incredible song-writer and musician that stopped by the studio with some songs for us to play! I'm very glad to have had the chance to hang out and get to know Brandon better and I hope you enjoy getting to know him too! 87. Ep. 54 - Tulsa Luchadores! Bar Fly, The Monkey, The Bear, and Bart Ender, luchadors competing with the ELWF (Elote Luchador Wrestling Federation), stopped in to talk about the Cinco De Mayo Festival and to speak a little about what they enjoy about wrestling! It was really a great time getting to hang out with them and learning about the creativity and athleticism that goes into their art. Brujo Roots joined us to be the first band to play live in our new studio! I really enjoyed speaking with them and getting to know them a little better! When I asked them to place themselves in a genre they came up with Latin-Funk-Fusion. Make sure to find them on Facebook and see them live if you're able! Brett Birdsong is an award winning photographer who has achieved top ratings from all of the leading photography people who sound important. With the philosophy of "Through the bushes, to the picnic" Brett stopped by the studio to share some laughs and some insight on some matters that should have never been discussed. Our friends in Quiet Company are visiting Tulsa on May 12th so Tommy called to talk with us about their new albumTransgressoand let everyone know about the show! Find Quiet Company at the links below! Deana McCloud, Woody Guthrie Center's Executive Director, stopped by our studio to tell us a little about Woody Guthrie and let us know what the center is doing to celebrate their 2nd Anniversary! Welcome to From a Handheld Recorder in Tulsa! I was given the opportunity to open for Drew Holcomb & The Neighbors at Cain's Ballroom so we (Lourdes & I) took our handheld recorder and captured it! The crowd noise is much louder than expected but I think it is still a super cool thing from a super cool night. I hope you enjoy my songs! Sameer Bhattacharya, Flyleaf's Guitarist, visited our studio to speak about what Flyleaf is doing and tell us about the meaning and emotion written into the songs on their newest albumBetween The Stars. This Month's featured artist is Kelsey from KOPECKY. She called in to talk to us about the band's upcoming album and let us play "Quarterback" as a preview! Kostis Protopapas is the Artistic Director for the Tulsa Opera. He stopped by to talk a bit about what Opera is today and about it's history. Check out the Tulsa Opera's production ofOf Mice And Menwhich opens this weekend! Welcome to our first episode from the new studio! Our friends from Tulsa's Historic Cain's Ballroom joined us to be our first guests and we are honored to have them. Brad, Chad, and Hunter came to share some stories and even announce a few shows! This week DJ Rogmahal came over and brought some tracks, some stories, and some information on what exactly goes on in the DJ booth! We didnt know it then but this was the last episode to be recorded in this basement! We'll see you in two weeks with another episode from the new office. Find RogMahal on the interwebz! Van Riss is a singer-songwriter and long time friend who visited to play some songs and tell stories from the past that probably should have stayed there. "Control what you can, confront what you can't, and always remember how lucky you are to have yourself." We would like to introduce a new monthly segment where we feature an artist who isn't available to visit the studio but is still doing cool things! This month's featured artist is the alternative rock band The Maine. We had the opportunity to chat with vocalist John O'Callaghan about the band and their upcoming album AMERICAN CANDY out March 31st. Dirty Creek Bandits, a band blending Folk, Bluegrass, Country, and Psychedelic Rock, stopped by our studio to play some songs and to catch us up on what's been going on and what to expect in the future. This episode features our new friends in the band Skytown.. Hell Yeah! In this episode, we introduce the up-and-coming duo, Onyx Owl. Consisting of Hector "Ultra" Ultreras and Elissa Ericksen, the pair stopped by the basement with a bottle of tequila and some songs to share. Parker Simon is an American born pop singer, song-writer, musician and independent recording artist who stopped in to discuss his song writing and let us play some of his songs from his debut EP titled Blow It Up. Congrats Emily Shelton for winning the Facebook giveaway for Steve Gerkin's book "Hidden History of Tulsa!" This weeks episode features Billy Moore, Bobby Moore, and Ben Mosier who are three of the four members of Swamp Fox. Steve Gerkin is the author ofHidden History of Tulsaand a contributing editor for the magazine This Land (Tulsa). Spade Cooley: The murderous maestro of western swing. JB Stradford: The wealthiest man in Greenwood. After a busy year of touring with Chase Rice, guitarist Brandon Autry stopped by to catch up and tell stories about being on the road and even brought a few songs he's recorded on! Find Brandon on social media! Here is where to find the artists whose songs we played! Josh Gammon, from the Center Stage podcast, stopped in after we both saw Garth Brooks in concert. This episode is both of us telling the story of that magical time! This episode features our first attempt at having songwriters over to play a few songs live! Vagittarius & Chloe Johns came over, hung out and played some of the most beautiful music! Josiah Leming even called in to catch up and tell us about his new song "Can You Hear It"
Well Hung Heart returns to the basement! Well Hung heart, a band from Orange, CA, returned to Tulsa on their New Years Eve tour and they stopped in to catch up and check out the improved studio! For more Well Hung Heart Goodness check out Ep. 5 of this podcast or find more information from the links below. Ian Moore, a musician from Austin, TX, stopped in on his tour to hang out and let us play some of his songs from his albumEl Sonido Nuevoand even played us an acousic song! I really had a great time getting to know Ian and where his creativity and inspiration are drawn. Please check out his website and buy some of his music! James Robert Webb and Cody Woody, Nashville recording artists residing in Tulsa, stopped in to hang out and let us hear some of James' Christmas songs! Miles Ralston is a singer-songwriter who stopped in to catch up and share some of the songs from his latest release,To Those Who Doubt. The Kayfabe (KeyFob), Wil Sutherland and Chris Gazaway's new project, stopped in to share some of their new EP #TheDenverSessions with us. Please check it out on iTunes and give them a like on Facebook! Travis Kidd stopped by the basement to hang out and even brought some previously unreleased songs! Thanks to Travis and everyone listening! The Phuss is a Rock and Roll band from Dallas, Texas. They visited the basement back in October to talk about their new albumOn the Prowl, their month long tour, and how Ebola was no big deal! None of the information in this episode is true. Please like the podcast on Facebook! We Make Shapes is a Tulsa band playing Electronic music that you would probably hear in space! I, from now on, will describe them as a band making SPACE JAMZ. Thanks for listening to Episode 30! I think that is a big accomplishment! Drew McKenna is a friend of mine, a wonderful person, and the host of The Unrequited Songs Podcast! Make sure to check out her podcast and submit your original songs to be played on her show! This week, The Nicnos guys stopped in on their way to play some music to catch up, talk about how their album has been doing and just get some hanging out done! Make sure to like them on Facebook and join me Nov. 8th at their show at The Vanguard with our mutual friends in Gooding! Tulsa Comedian, CR Parsons, stopped by the basement this week to talk about his career, Tulsa comedy, and many other things! Visit CR on social media! From a Basement in Tulsa on social media! Dom from Carol's Cousin and his manager Frederic(Cab) stopped by the basement to talk about their U.S. Tour, their hometown Belfort, France, his one man project, and plenty of things "I don't remember." Thanks to David and J.D. Castro for introducing us. I am really glad to have met and became friends with these dudes and got to hear their cool story! On this week's episode, Sam & Branjae return and they brought our friend Nathan Wright with them! Branjae recently released her much anticipated album, Powersource, which is now available everywhere! Please check out Sam and the Stylees, We Make Shapes, and Branjae's music in the links below! This weeks episode features the Tulsa band summit! They dropped in and brought some songs off of their new self-titled EP set to be released at The Vanguard on Oct. 24th. This week David Castro came back but this time he brought the whole band and we got to hear some of their new album first! Their new album,Highways Calling, is set to release Oct. 10th and we are playing at The Hunt Club that night to celebrate! This week, Tulsa Poets, Claire Collins, Written Quincey and Sterling Matthews stopped by the basement to talk about Tulsa's spoken word scene, the importance of poetry in today's culture and our up coming show with Neil Hilborn! Check them out every Monday at The Fur Shop for Cypher 120. This week Singer/Songwriter, stand-up comedian, and host of Trial and Eric stopped in to ask the important questions, "What is Twin Falls, Idaho doing all day and why do they need all those stickers?" Thank you for listening and please check out http://www.erichiman.comand find him on all of the social medias! This week the Texas band, The Raven Charter, stopped by the basement on their way to play songs with our mutual friends Sleepwalking Home. "Weiners, Dragons, and No Direction"
128. Ep. 18 - Terry Gamel Ft. A Visit From Abandon Kansas! This week's episode features Terry Gamel who is involved with Oaklake Trails Naturist Resort and stopped in to talk about Nudist Culture. But first, a little hello from my friends in the band Abandon Kansas! This week, the psychedelic rock band Roots of Thought stopped by the basement to talk about their music and get back their mascot, Frederick the Owl, that I have been holding hostage! Gabe DeRose is a long time friend and someone I enjoy talking with and hearing all about his adventures! I am super excited he was able to take a little time and come talk into microphones with me. I really enjoyed our conversation and I hope you do as well. Josh and Garrett are the hosts of RSU Radio's "The Wayback Flashback" and stopped in to celebrate the show's 2 year anniversary with me! Congrats to those dudes! Make sure to check them out on 91.3 FM, TuneIn Radio, and on their future podcast #GarthMullet! Dustin Storm is a good friend of mine and also the singer of the Tulsa band All About A Bubble. Check out their new single " The Sailor, The Captain" on iTunes! My good friends FM Pilots are the guests this week! Josh and Nick came over and talked with me about stuff like their new single "With You" and plenty more ridiculous things. Sleepwalking Home stopped in on their way to practice to hang out and talk about their new album "Army Of Skin". Rockwell from Stephen Speaks, a good friend of mine, came over to talk with me about his plans for his new album "Alive To Fight" and the KickStarter campaign he has now launched to fund it! This Episode Features Sick/Sea a 3 piece band from McAllen, TX sent to me by NoCover Tulsa! I had so much fun discussing #Naders and Rush Hour and the fact that we should all catch them at Center Of The Universe Festival! Sarah Dickenson and Conor Robb stopped in to tell me about their bands Moonshine and The Dull Drums but mostly about Tulsa Psych Fest! LolliePop and Brie Coquette stopped in at From a Basement in Tulsato tell us a little about Burlesque and Oklahoma's Biggest Burlesque Exstravaganza! beneffitting Tulsa Animal Welfare and Epic's Pit Bull Rescue. Jason Ferguson hanging out and talking with Branjae Jackson and Sam Jones about the most random stuff and things so far! they can be found playing music together or also in their separate bands. Jason Ferguson talking with friend and Musician David Castro discussing, among other things, our recent trip to California. Jason Ferguson sitting and talking with Tulsa based Comedian Michael Zampino. Jason Ferguson sitting and talking with Lee and Angie "El Dub" Walsh.